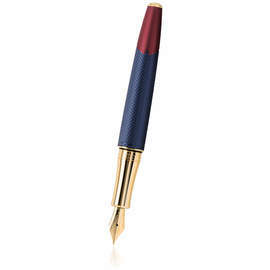 Caran d'Ache is Switzerland's only manufacturer of luxury writing instruments. 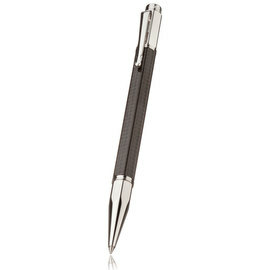 Founded in 1924, Caran d'Ache is a product of Switzerland's long tradition of watch making and jewellery manufacture. Each Caran d'Ache product is manufactured in Geneva by hand, using the combination of traditional craftsmanship and modern manufacturing techniques. 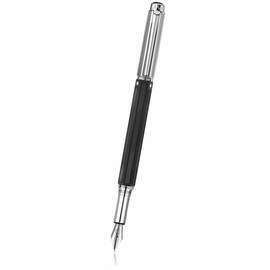 Caran d'Ache pens are made to the highest of standards - as you would expect from a Swiss manufacturer. 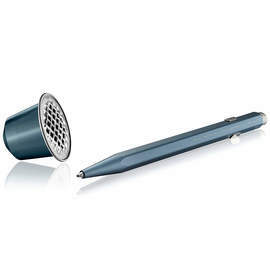 Caran d'Ache produce fountain pens, rollerball and ballpoint pens, and mechanical pencils across its collections. If you cannot find what you are looking for, please contact us as we are able to supply any item you require from the Caran d'Ache writing instrument collection. The 849 originally launched in 1969 has remained popular ever since, with its clean hexagonal body the 849 is both smart and informal. Available in numerous solid powder coated colours, there's an 849 to suit anyone. The Fluo 849 takes the same form as the classic, but is injected with bright fluorescent anodized colours for a pen that won't be missed. 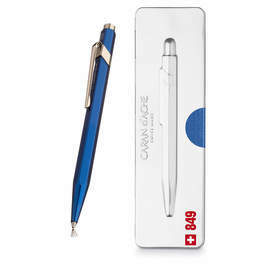 The 849 Gift Line collection presents Caran d'Ache 849 ballpoint pens in a choice of three special metallic finishes, each presented in slim, elegant boxes of the same finish. Choose from the 849 Original, 849 GoldBar or 849 Brut Rosé. The Metal-X version of the 849 is available in a selection of anodized colours. The 'Pop Line' presents a variety of vividly coloured Caran d'Ache 849 Metal-X ballpoint pens in slim, elegant boxes with a matching colour accent. 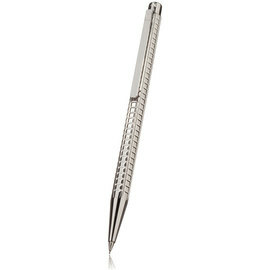 Unique presentation tins make the Pop Line an ideal way to give the popular 849 pen as a gift. Post-consumer recycled materials from aluminium Nespresso capsules are repurposed here into the body of these very special 849s. This very special 'Astrograph' limited edition is the result of a collaboration between Caran d'Ache and Swiss watchmaker MB&F. The project celebrates the exploratory genius and childhood dreams that spark great technical feats. 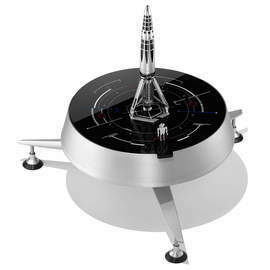 The integrated rocket pen and launch pad design is limited to 99 pieces worldwide for each finish. 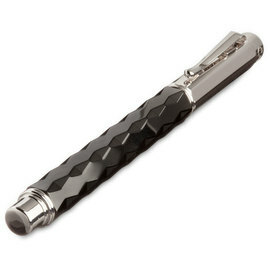 The Ecridor collection from Caran d'Ache features their trademark hexagonal shaped barrel embellished with elegant engravings in a number of pleasing patterned designs. 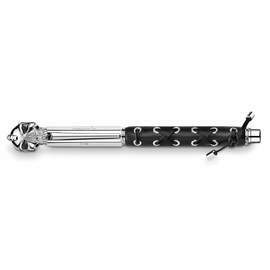 Barrels are available in silver, rhodium, gold and a new rose gold finish. 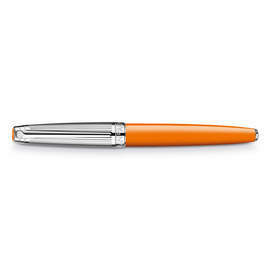 The Ecridor XS is the smaller version of the standard sized Caran d'Ache Ecridor range. 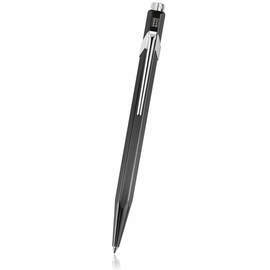 Available as ballpoint pen or mechanical pencil. The Caran d'Ache Cubes range is from the prestigious Hexagonal collection. This luxury range features deep guillochage on all six faces of the hexagon, producing the multi-faceted geometric 'cube' design. Each piece is silver plated and rhodium coated, giving a lasting no-tarnish sparkle. 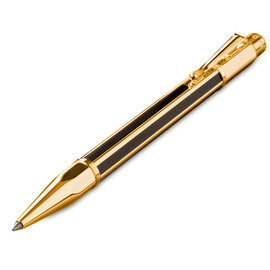 The Cubes range is available as a ballpoint pen, rollerball pen, mechanical pencil and fountain pen with 18K gold nib. 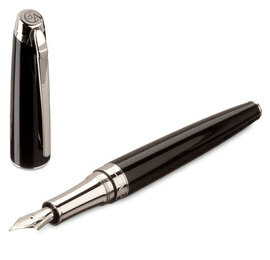 These classic pens are effortlessly luxurious and timeless in design with soft curves and understated exuberance. 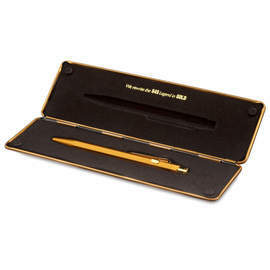 With either gold or rhodium plated trim the Léman is available in four modes - fountain pen, ballpoint and rollerball pens and as a mechanical pencil. The Léman bicolour is available as fountain pen, rollerball or ball point pen or as a mechanical pencil with 0.7mm lead. High gloss lacquers contrast crisply with brilliant, rhodium-plated or rose gold accents to great effect in these timeless designs. The slim profile offers a more diminutive counterpart to the rest of the Leman range. Leather Caran d'Ache pen cases available to hold one or two pens. The perfect accessory to protect and complement your pen. 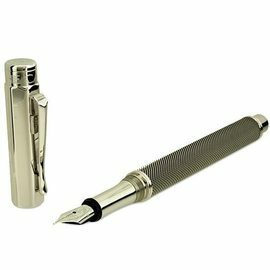 Precision engraved and polished, made from 316L grade stainless steel, the RNX.316 reflects the Caran d'Ache ethos of design, precision and consistent quality. The Carbon 3000 Varius from Caran d'Ache draws on inspiration from racing and sailing, utilising 3000 strands of interlaced carbon fibre to create an eye-catching high-tech collection. 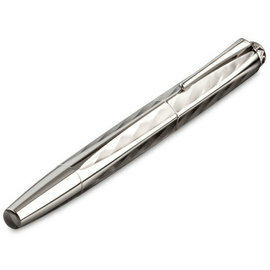 Finished with a contrasting rhodium plate to create a truly desirable writing instrument. 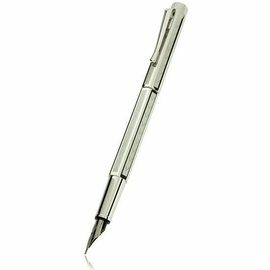 Available in four variants; fountain pen, rollerball and ballpoint pen and a mechanical pencil. The silky smooth feel of the multi-faceted barrel of the Varius Ceramic emanates from its ultra-hard ceramic surface. 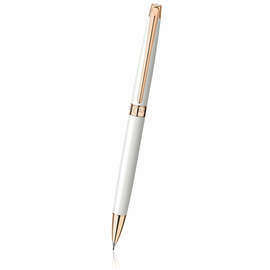 In addition to the tactile writing experience the use of ceramic provides exceptional scratch resistance, helping to retain its elegant glossy appearance, year after year. With the Varius Chinablack, Caran d'Ache have skilfully combined the precision of Swiss engineering and the perfect finish for which they are renown, with the ancient skills of the Chinese lacquer masters. The resulting range of writing instruments are both elegant and practical, taking full advantage of the hard-wearing properties of traditional Chinese lacquer and the comfortable grip of the hexagonal barrel. The Chinablack is available with either a gold or silver/rhodium finish, both of which are a perfect compliment to the deep, lustrous black of the Chinese lacquer. Rose-gold plated accents are used to accentuate the subtle grain of deep ebony barrels in this unique and elegant range. 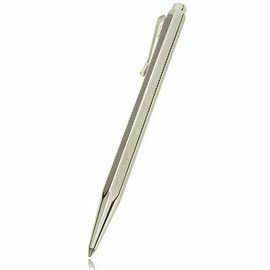 Finished in either gold or rhodium plate this unusual finish is not only eye-catching but also very tactile and pleasant to write with. Caran d'Ache have teamed up with American architect Peter Marino, who has drawn many of his magnificent buildings with Caran d'Ache pens. Here the architect lends his talent and love of fine materials to create this unique Varius design. This truly unique limited edition was dreamed up by accomplished American architect Peter Marino, who has drawn many of his magnificent buildings with Caran d'Ache pens. Here the architect lends his talent and love of fine materials to create this unique Varius limited edition. Genuine rubber gives the Rubracer range tactile and intricately textured matte black barrels, which contrast with lustrous Rhodium-coated accents. The Caran d'Ache Varius Silas range is a special numbered edition featuring silver-plated, rhodium coated metal barrels with shimmering blue-grey facets. Each face of the hexagonal barrel uses a silicon coating, producing unique kaleidoscopic reflections that range from blue to grey. Caran d'Ache celebrate the Chinese Zodiac Year of the Dog in this special limited edition range. 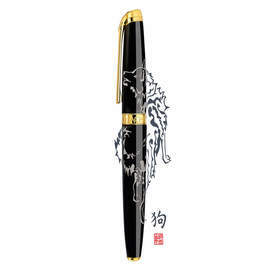 The pens are emblazoned with a depiction of the zodiac sign and are limited to 888 fountain pens and 888 rollerball pens worldwide - a very lucky number in China. 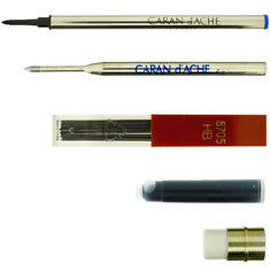 Geniune Caran d'Ache refills - the complete range to fit all Caran d'Ache pens and pencils.